Dress up your commercial-scape with outdoor artificial topiaries, brought to you by Planters Unlimited. 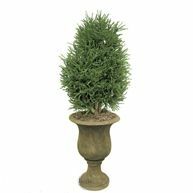 Our artificial topiary plants come in a range of styles and sizes including authentic looking spheres, spirals and obelisks. We also offer quotes for custom orders to mirror the unique style of your project, including shapes modeled after branding and logos. This collection is comprised of outdoor rated products made with built-in UV protection. Each of our units are fade and rot resistant with a life-like look. Choose a classic spiral shape to line the edges of a pool deck. 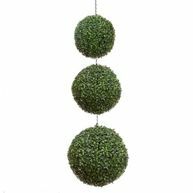 Or, envision our funky spherical designs flanking outdoor seating at an urban cafe. 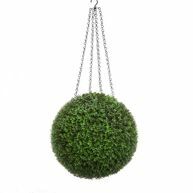 For questions on stock styles and sizes, or to get a quote for custom fake topiaries, please contact a knowledgeable member of our team. 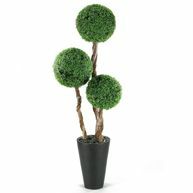 This collection of artificial topiary plants mimics the sophistication of an ancient horticultural art form. 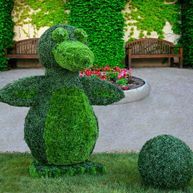 While live alternatives require years of focused shaping, faux topiary plants capture the discipline of topiary art in a convenient, carefree package. Available in classic, contemporary or custom shapes, select a style that compliments your terrace or sundeck. Choose spiral designs for a regal feel in traditional row applications or scattered strategically for privacy. For a versatile aesthetic complementary to either classic or contemporary design, ball or spear obelisk shapes bring flexible silhouettes that can evoke the feeling of old or new depending on the application. In addition to our variety of shapes and sizes, Planters Unlimited is proud to offer custom outdoor options. 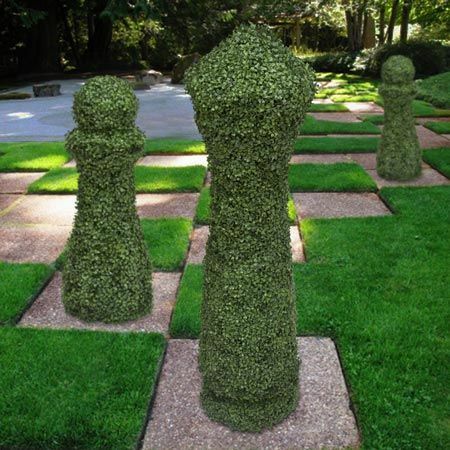 If you have a logo shape you would like to capture, we can work with you to formulate custom shaped and sized plants. If your commercial-scape requires a personality specific to strategic branding, we'll work with you to create a design that speaks to your trademark style. This collection is outdoor rated with UV protection built into the structure of each plant and leaf, unlike other brands that require spray-on substances. It's this built-in protection that gives our products superior, fade-resistant performance. 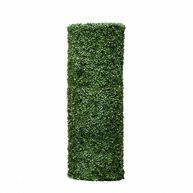 Fake topiaries are sold and ship with the plant only. For recommendations on pots to accommodate your order, one of our knowledgeable project planners can offer suggestions from our extensive selection of large commercial planters. From ornate and traditional, to sleek and modern, Planters Unlimited has something to accommodate your purchase. For an individual consultation on custom requests, or to ask detailed questions about the sizes and styles you see on our website, please contact us directly by calling 1-888-320-0626, 7am-5pm PST, M-F.